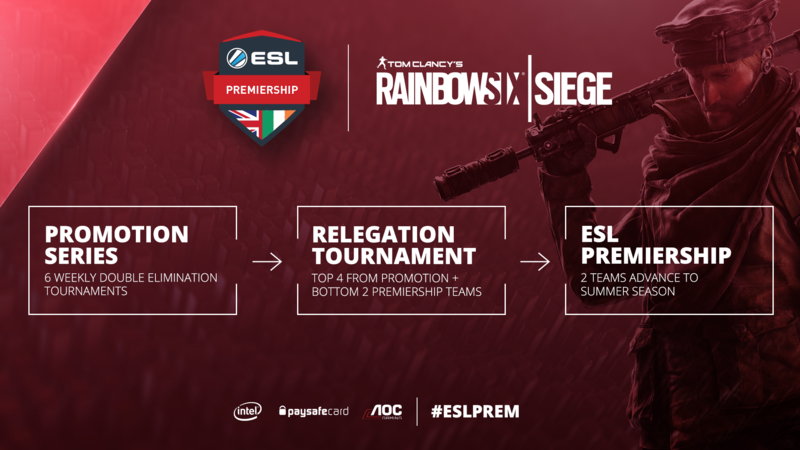 Today, we are proud to introduce the Rainbow Six Siege Premiership Promotion Series. From Tuesday 5th March 2019, at 19:00 GMT, teams will participate in 6 weekly Rainbow Six Siege PC tournaments following a double elimination, best of 1 format, earning Promotion Points every week they participate. At the end of the 6 weeks, the top 4 teams will be entered into a new relegation tournament for a chance to earn their spot in the 2019 Summer season of the ESL Rainbow Six Siege Premiership. With that in mind, we’re also announcing a change to our Rainbow Six Siege Premiership postseason. Effective from our current Spring season, 6 of the 8 Premiership teams will be invited back to participate in our next season. The bottom 2 teams in the standings at the end of the regular season will be moved into our new relegation tournament. These changes apply to all subsequent seasons. Making this change will increase team stability as it encourages aspiring Premiership teams, trying to qualify through the Promotion Series, to stay together and develop, while also adding increased security to more of the current Premiership teams as only 2 teams will face relegation, instead of only 4 teams being invited back and having to re-qualify through the open qualifiers. How do I now qualify for the Premiership? The Promotion Series will be the only way to qualify for the ESL Premiership for the foreseeable future, so it’s important to participate in as many of the 6 weekly tournaments as possible if you want to be in with the chance of competing. What is the Relegation Tournament? The Relegation Tournament is a 6 team, double elimination, best of 3 format where the 2 current Premiership teams are pre-seeded into each Winner’s Bracket Semi-final. The Spring Relegation Tournament will be held on Saturday 13th April & Sunday 14th April 2019, starting at 15:00 GMT. Where can I sign up for the Promotion Tournament? You can sign up at https://play.eslgaming.com/rainbowsix/europe-pc/r6siege/major/esl-premiership from Tuesday 19th February 2019, at 12:00 GMT.